Garage floor resurfacing can be done successfully if you know how to prepare, what to use, and how to install the resurfacing material. On this page I'll cover what to use and how to install the material. See CLEANING GARAGE FLOORS to learn how to properly prepare the concrete for resurfacing. If you garage floor is in pretty good shape with just some cracks to repair check out GARAGE FLOOR REPAIR to learn how to fix cracks. If your garage floor is pitted, spalled, peeling, and chipped from old age, deicing salts, and everyday abuse, Ardex makes some great repair products that are fairly easy to use. 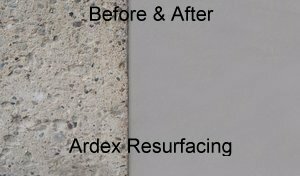 Ardex C-21 is what you use to repair any damaged spots greater than 1/8 inch deep. After the surface preparation, you mix the Ardex C-21 with water into a pancake batter like consistency. This first batch will be brushed into the damaged spots as a primer coat. After priming, fill the damaged areas and level off with a trowel or squeegee. Only do an area big enough to complete in about 20 minutes at a time. This material can fill spots 1/4 - 1/2 inch thick in one application. After the entire area is repaired let it dry for 24 hours. For a successful garage floor resurfacing application a moisture vapor blocker should be used. If you've ever seen moisture on the surface of your garage floor some of that is coming from the ground under the concrete. This moisture will eventually cause any resurfacing material to fail. There are lots of these blockers on the market, Ardex makes one called Ardex MC moisture control system. It's an epoxy material you paint on. The first coat is the primer and the second coat is the sealer, sand is broadcast into the second coat so any topping material will bond to it. Once the moisture blocker has dried Ardex CD Fine can be used to skim coat the entire garage floor surface. This material can be mixed fairly loose and goes down as fine as 1/32 of an inch. Use a hand trowel or squeegee and work your way from back to front. Don't overwork the material, you can sand down any ridges or apply a 2nd coat for a really fine finish. If your garage isn't damaged that bad, just a few spots here and there and your going to coat it with an epoxy paint, then I would use a product from RapidSet called Cement All. You mix this stuff with water and patch the rough spots according to the directions. It dries very fast allowing you to paint over it the same day. It can also be used for resurfacing garage floors but it dries so fast it takes some getting used to. Garage floor resurfacing is something you can do yourself, although if the surface is badly damaged I would recommend hiring a professional.